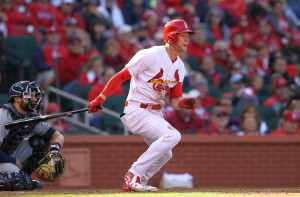 The St. Louis Cardinals were almost no-hit in dropping the series opener with the Chicago Cubs 4-1 at Busch Stadium Monday night. The Cubs Kyle Hendricks took the no-hit bid into the ninth inning before Jeremy Hazlebaker would take an 0-2 changeup out for a solo homer. Mike Leake took the loss for the Cardinals giving up four runs, three earned, on six hits over six innings. St. Louis is still a half game back in the race for the second Wild Card in the NL behind the New York Mets.